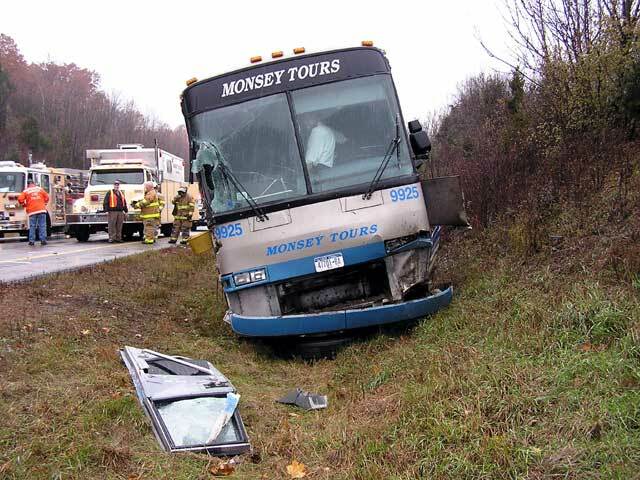 FISHKILL–A sign installation boom on a truck smashed the windshield on a Monsey Bus Company bus as it traveled on I-84 in Fishkill Monday morning. The accident occurred near the Route 52 exit eastbound on the superhighway. 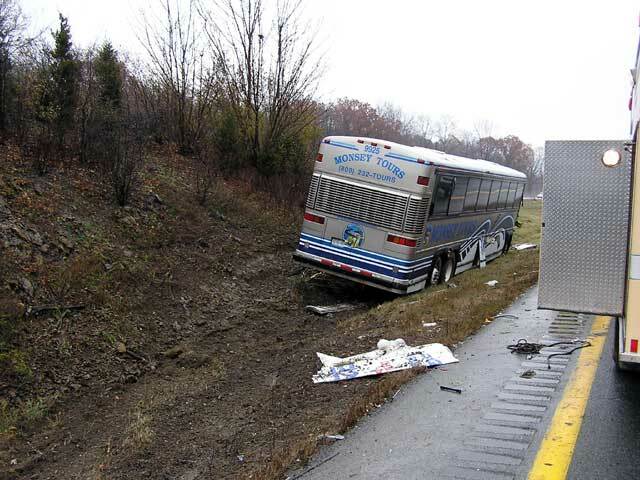 State Police said the truck and bus drivers dispute which vehicle swayed across lanes, but the bus driver ran off the road after his windshield broke in the 10:15 a.m. accident. 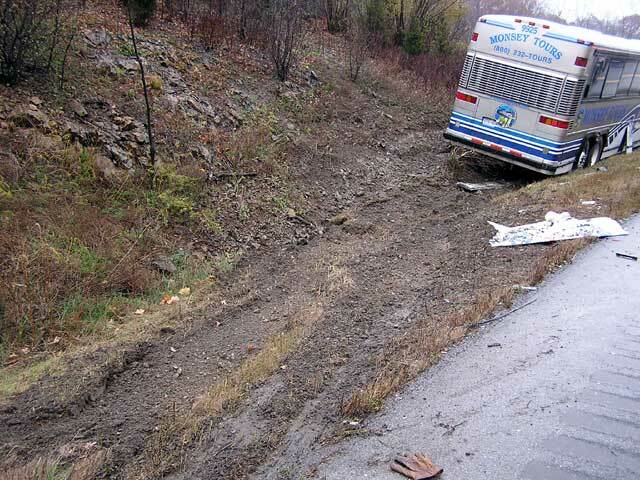 The coach bus, based in Spring Valley, had some 45 college student passengers. One sustained a minor head injury, according to police. One lane of I-84 was blocked for some two hours causing two to three mile backups to the Newburgh-Beacon Bridge. Rombout Fire Department personnel assisted in traffic control at the scene. FISHKILL– The boom on a utility vehicle hit the windshield on the right-hand side of a tour bus in an accident this morning that closed an eastbound lane on Interstate 84 around exit 12 in Fishkill for about two hours. One person was transported to St. Luke’s Cornwall Hospital with a minor head injury, according to Kevin Barry of the Rombout Fire Department. No tickets were issued and New York State Police at Newburgh are ruling it an accident. 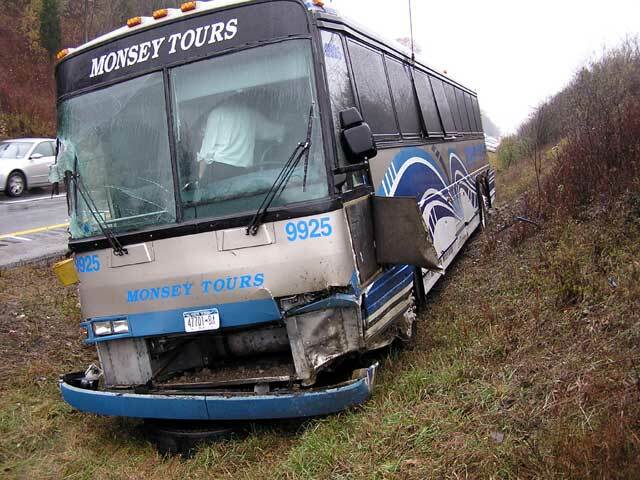 The bus with 44 people on board went over to the left shoulder into the ditch.